Cheery Zahau is a Chin activist from Burma working to restore democracy and human rights in her country. She left Burma when she was 17 and settled in India where she works extensively on women's capacity building within her local Chin communities. She successfully formed Women’s League of Chinland”. She is a major author for “Unsafe State” report with the first-hand research on systemic sexual violence against Chin women committed by the government military troops. She coordinated two major reports to UN UPR, UN CRC and contributed to UN CEDAW shadow reports. She has testified at the UN, British Parliament, US Congressional Hearing and other governments on human rights situation in Chin State and Burma. Miss Zahau currently is a graduate student at Institute of Human Rights and Peace Studies, Mahidol, Bangkok, Thailand. She lives in Burma. 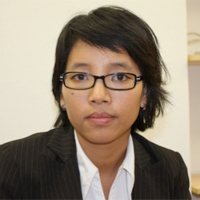 At the Myanmar (Burma) Update Conference 2013 she will speak on the topic of, “The return of Burma’s diaspora and its role in social, economic and political reform”.